Slowly cooking Belgian endives in a bit of butter and lemon juice transforms these otherwise crispy bitter leaves into tender, luscious, almost sweet bundles. It's kitchen alchemy at its finest. These endives are fabulous alongside a classic roast chicken or with broiled fish. Whether you're cooking the endives completely on the stove or starting them on the stove and finishing them in a hot oven, they are delicious. The second option is slightly superior since the endives tend to brown more evenly in the first place and don't require the final moving around and further browning at the end. Put a large, heavy frying pan, sauté pan, or pot over medium-low heat. Whatever vessel you choose should have a tight-fitting lid. When the pan is hot, add the butter. While the butter melts, trim off and discard any browned bits from the ends of the endives and any bruised or browning exterior leaves. When the butter is melted, lay the endives in a single layer in the pan. Sprinkle them with the lemon juice and salt. Pour the water down along the side of the pan (you don't want to wash off the salt you've just sprinkled on). If you want to cut the bitterness in the final dish even further than the braising will do alone, sprinkle the endives with the sugar. Cover the pan. You want a nice, tight fit with the lid. If steam is escaping, lay a piece of foil over the pan and then put on the lid. Or, cut a piece of parchment paper to fit in the pan directly over the endives and then cover the pan (feel free to do this even with a tight-fitting lid; it helps the endives brown evenly). Method 1: Reduce the heat to low. Let the endives cook, undisturbed, until they are very tender, about 30 minutes. 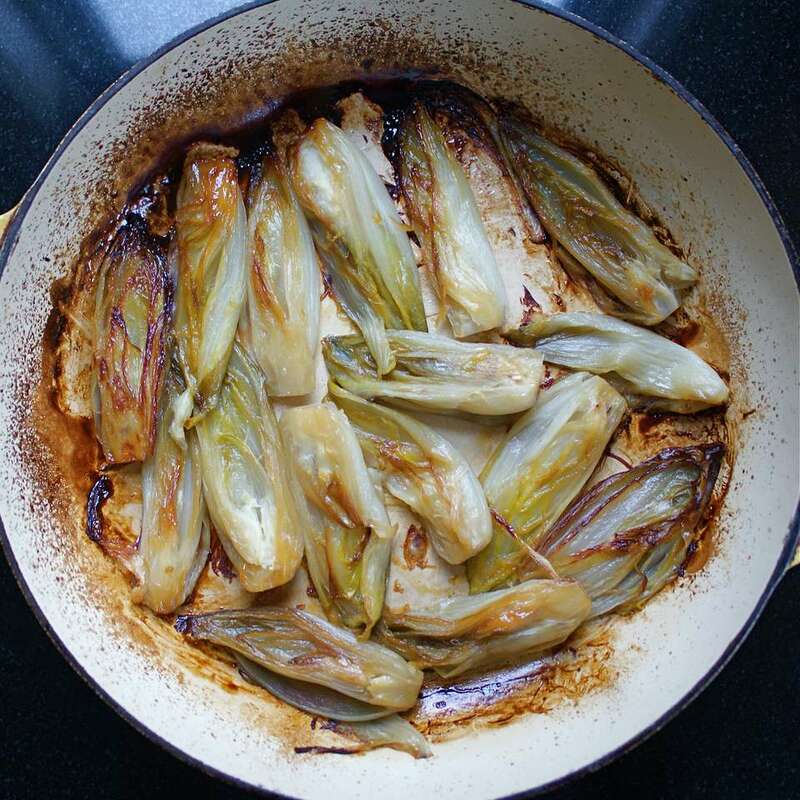 When the endives are very tender, remove the lid (and the foil or parchment paper, if you used it), return the pan to the stove if it's been in the oven, and cook over medium heat until any liquid in the pan evaporates and the endives start to brown, if necessary.